Email signatures are good marketing tools you can use within your company or when you are communicating with external stakeholders (clients, suppliers, government agencies, etc.). 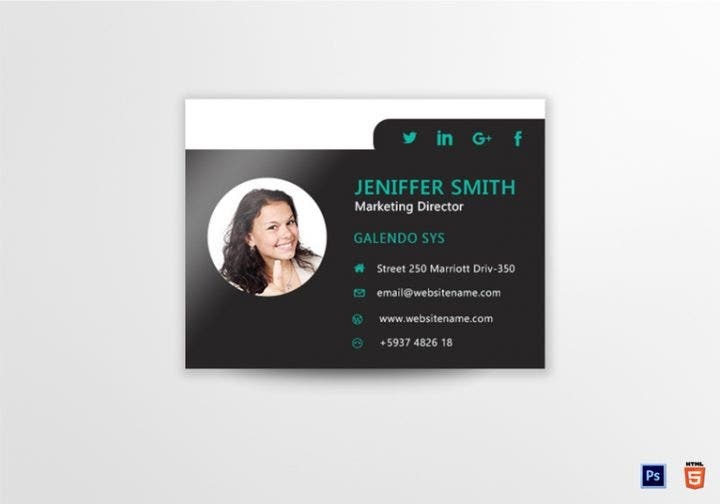 Unlike other marketing tools such as posters, flyers, and business cards where there is no limit on the designs you can apply, email signatures need to maintain a level of professionalism and should not go overboard with details. You may also see Sample Email Signature. Individuals working in marketing have the task of selling the company’s products and services. As expected for marketing personnel, numerous emails are sent to hundreds of clients per week. And all those emails include an email signature. 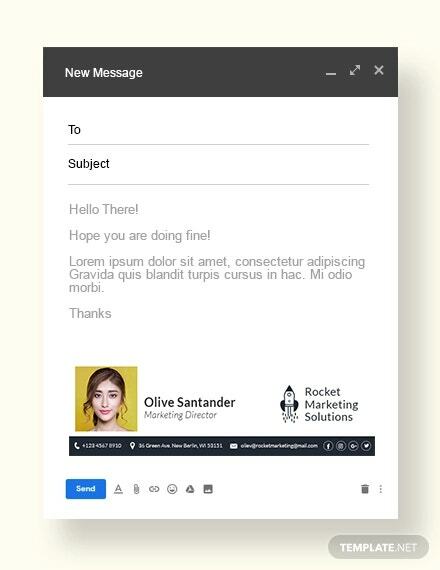 As previously mentioned, a level of professionalism should be maintained in creating a responsive email signature, but that doesn’t mean the signature should be absent of any design or detail. If you are in marketing, take a look at these multipurpose formal email signatures you can use for your next client call or sales pitch. 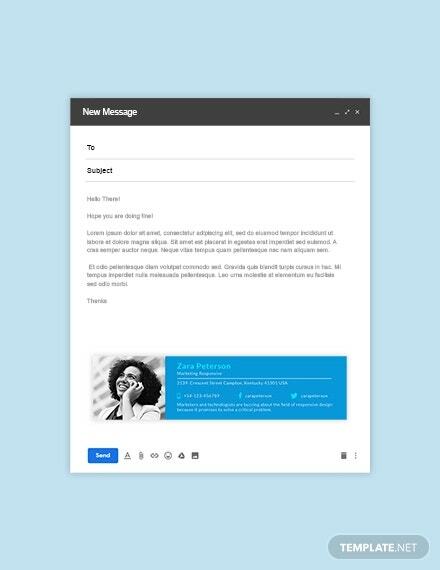 If you happen to be a marketing manager, then this email signature template is perfect for you. This template has a minimalist design and doesn’t use any background color, but the template still looks attractive. Input your details (name, designation, email address, contact number, etc.) and insert your photo for your own personal use. This marketing director email signature is one of the best email signatures to use for your marketing job. Edit the details to fit your own use and don’t forget to include your information (name, designation, email address, contact number, etc.) as well as your photo. The template has a beautiful black gradient design paired with green text. 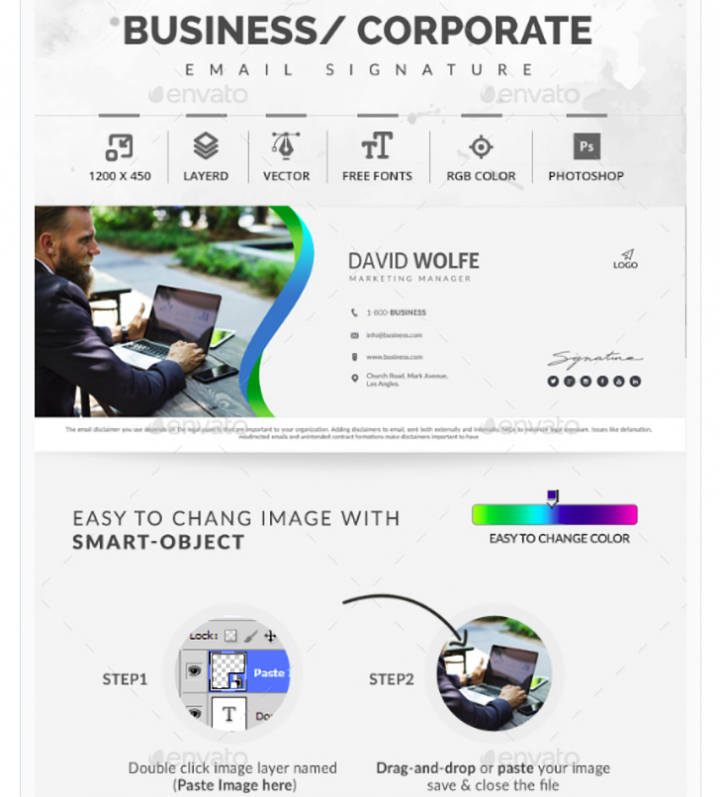 This email signature pack contains 10 signatures you can use for different business purposes. The template features 10 html files, 10 PSD files, 10 e-signature variations, eight color variants, full responsive HTML, speed support, and documentation. 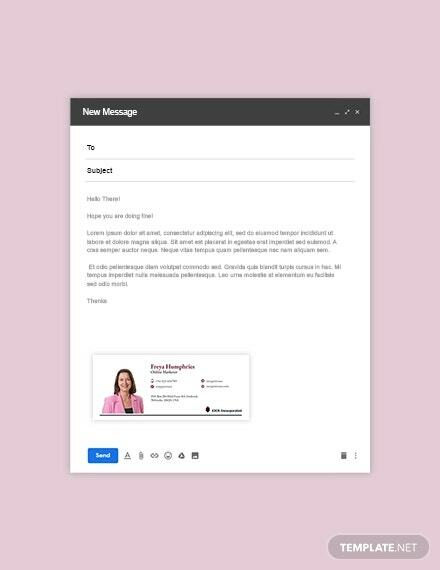 This email signature collection contains 301 modern and printable email signatures in PSD and HTML formats, 43 different layout options, and seven color variations. It is fully editable with HTML with free fonts and icons, a help file, and HTML files. This collection also features a more contemporary design and can be used for different purposes (either business or personal). 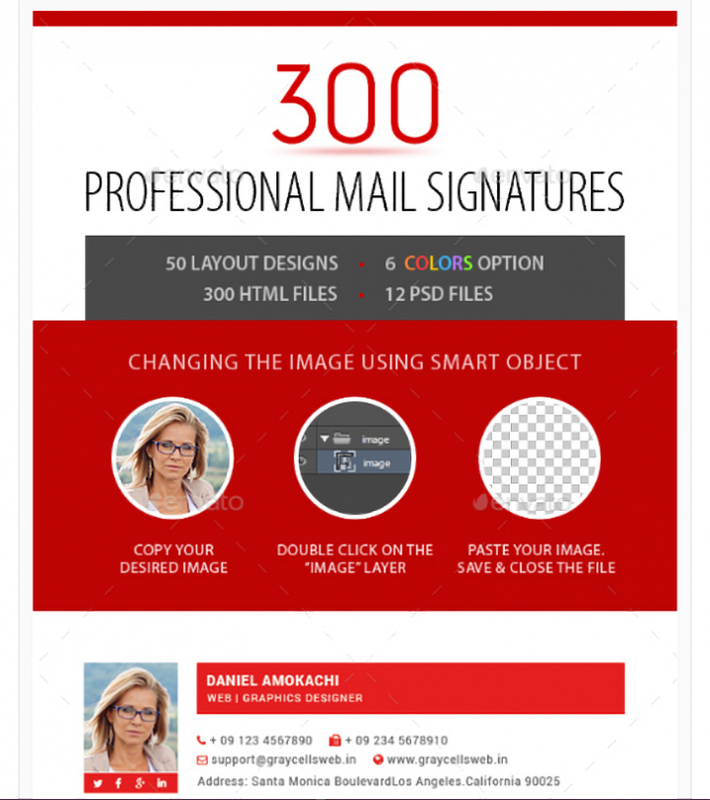 If you want the complete email signature collection, then purchase this 360 email signature set. You can even change your signature every day for the next year. 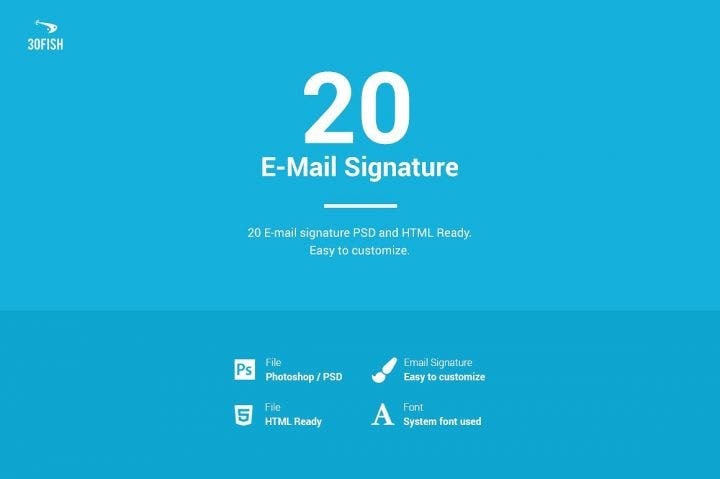 This collection contains 360 e-signature variations, 360 HTML files, 360 PSD files, color variants, full responsive HTML, speed support, and documentation. You can also choose from eight color variants (green, blue, pink, red, purple, orange, brown, and black). 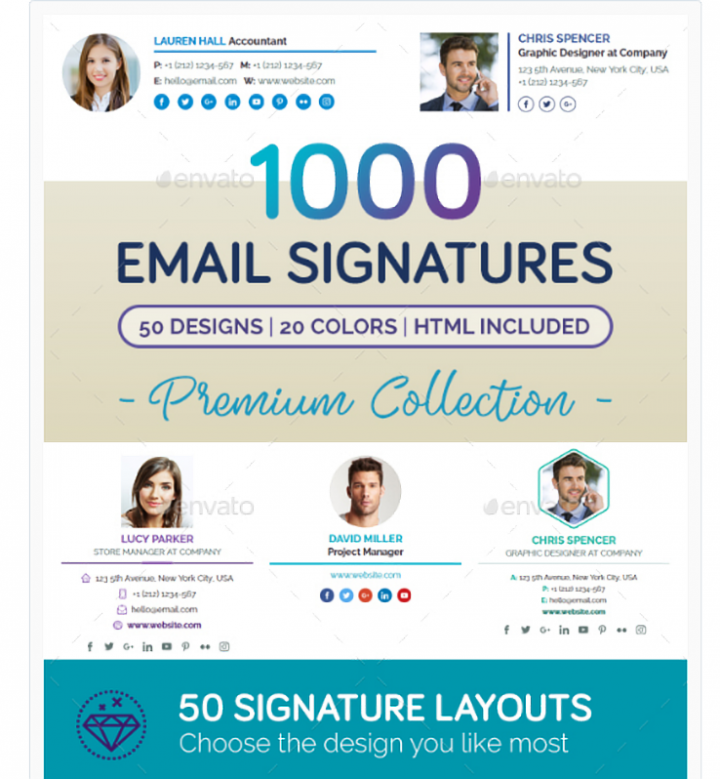 If the 360 email signature collection is not enough, then this 1,000 email signature collection is the one for you. You can use each email signature in this collection for the next two or three years. This template features 50 email signature designs in 20 color combinations, a smart catalog, alternative fonts (you can choose from new fonts Droid Serif, Lato, Montserrat, Open Sans, or Raleway), a responsive design or fixed size, and a professional and creative design. It is easy to adapt and customize, with fully layered and well organized PSD files, smart objects and vector shapes, free Google fonts, multipurpose use, and a help file. 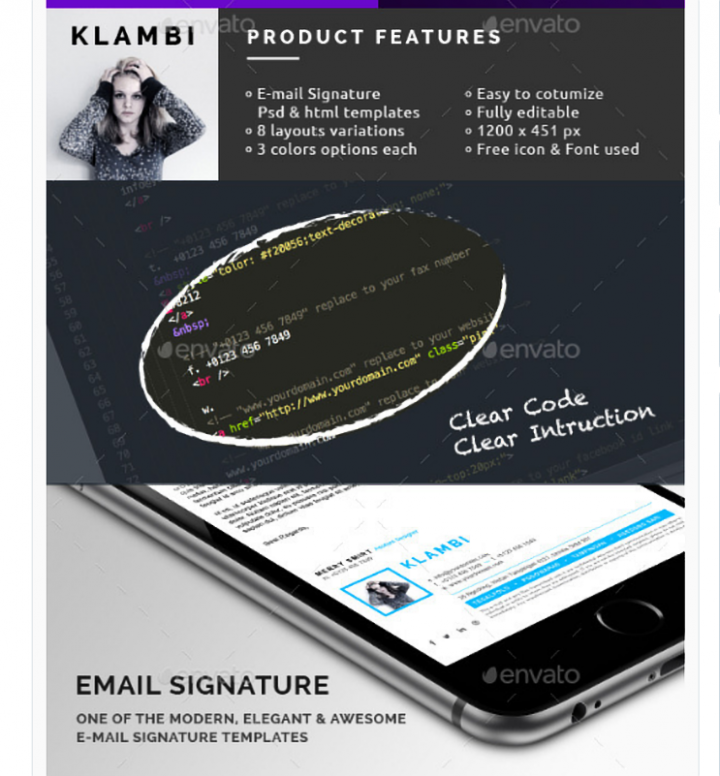 The email signature package includes 5,000 .html responsive email signature files, 5,000 .html fixed size email signatures files, 20 PSD email signatures files (only for the Lato font), smart online catalog access, one PDF help file, and AI trendy social media icons file. This email signature pack contains some simple and elegant signature templates which are perfect for your email branding. This pack contains free icons, multiple styles in two colors, two PSD files, 20 HTML files, RGB colors and free online storage icons. This template pack also contains more contemporary designs as it uses flat and modern styles. It is easy to edit as well. 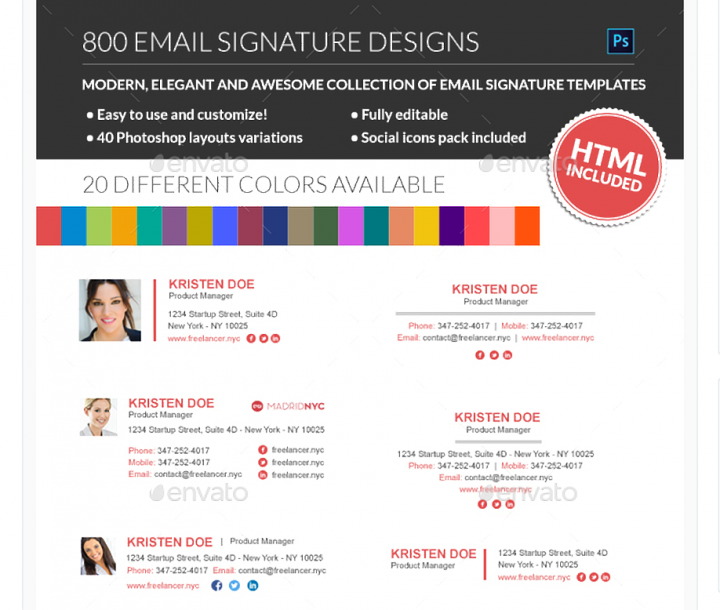 This 800 email signature pack has some of the most extensive personnel email signature designs around. Similar to the 1,000 email signature pack above, this collection contains numerous email signature designs which you can use for the next few years. This template features 40 different layouts variations, 20 different color variations, designs created in layered PSD format, easy customization, and free icons and fonts (Arial). 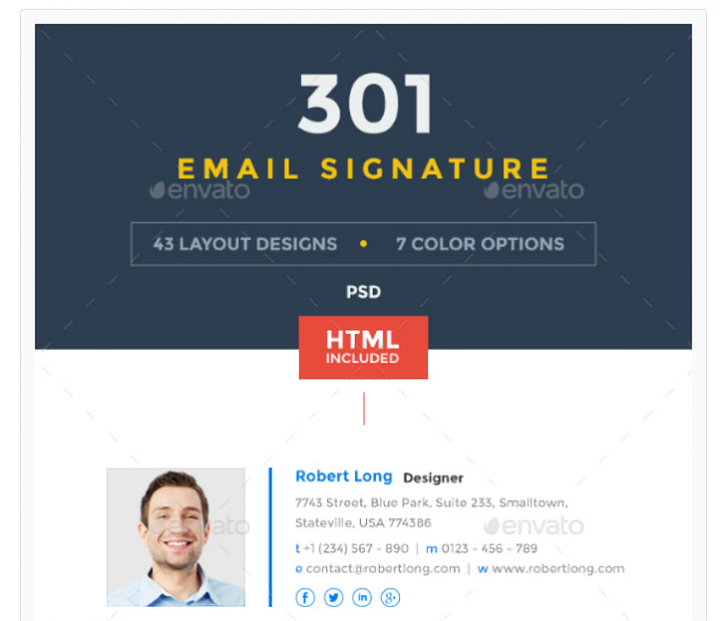 This email signature pack containing 20 email signatures is perfect for your next email blast. This pack features a PSD file, HTML compatibility, easy customization, system font availability, unique designs, and documentation. There are 11 bonus flat social media icons and categories you can use (full-stacked, two columns, without photo, and irregular). 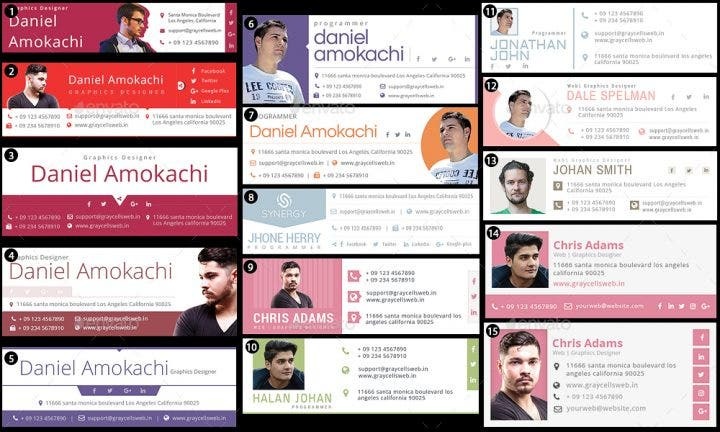 This template contains 12 email signatures (PSD file), 300 HTML templates, 50 different layout options, six color options, HTML and PSD compatibility, free fonts and icons, a help file, and also an HTML file. The template uses a unique, professional and creative design. This simple business corporate email signature uses some clean color designs and detail. This template features a 400 x 300 size, 72 dpi resolution, RGB color layered files, and fully editable fonts. 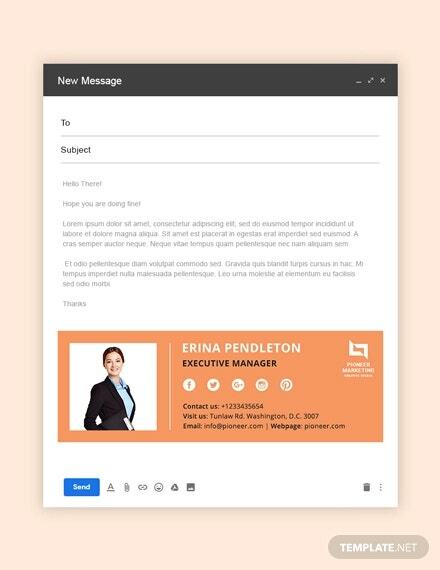 Nexa was the font used for this outlook email signature template. This corporate or business email signature is one of the best email signatures you can use for your business needs. The template (1200 x 450 size) contains editable layers and vector shapes with a clean and professional design. The fonts used for this email signature are Aller and Lato. 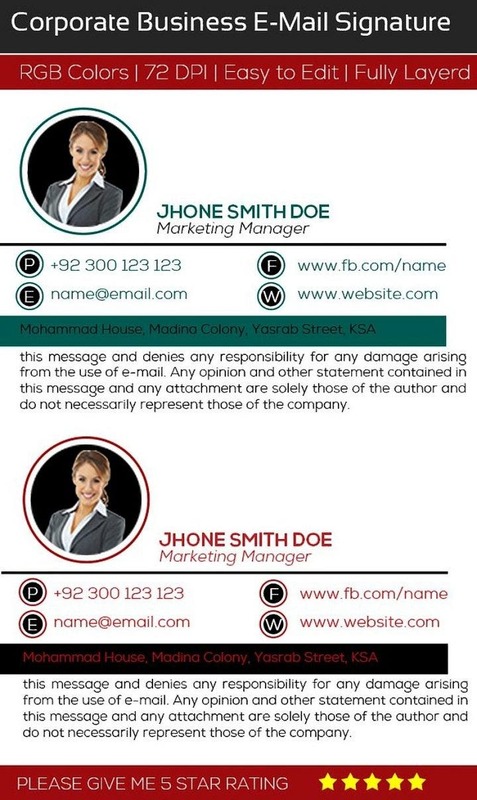 This is another email signature template you should seriously consider for your marketing needs. This responsive email signature (1200 x 451 size) template features 24 PSD files, eight layout variations, three color variations, easy customization and editing, and a help file. The fonts used for this template are Arial, Verdana, Raleway, and cool Font Awesome. 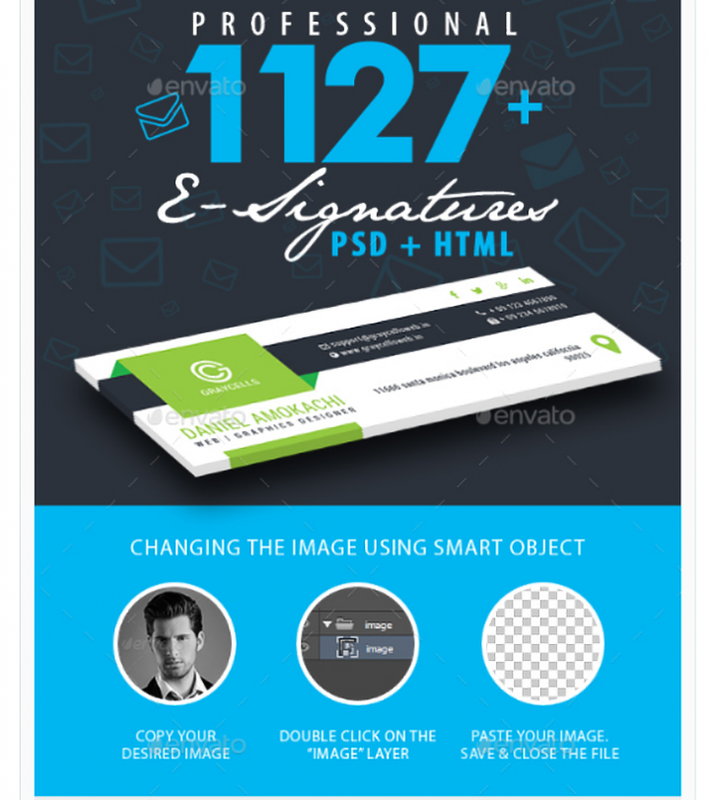 This 1,127 email signature pack is great for company use, especially for a large-scale corporation. 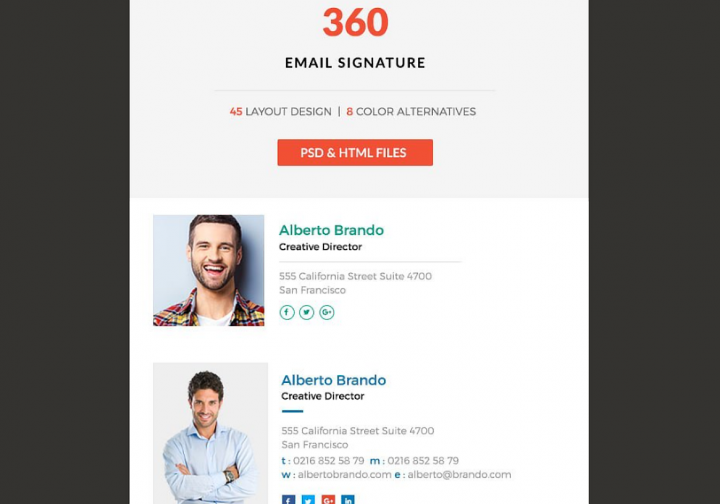 This template features 1,127 email signatures (PSD and HTML templates), 103 different layout options, HTML and PSD compatibility, free fonts and icons, 10 to 13 color options for each PSD file, and a help and HTML file. 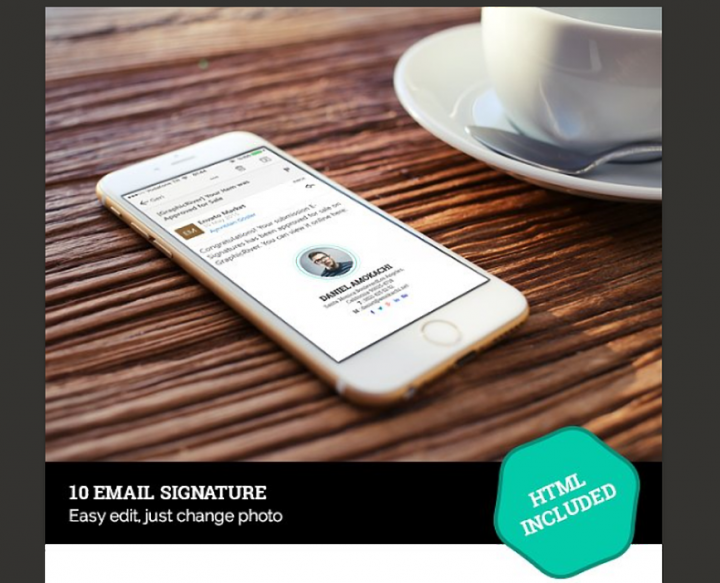 Use this 915 email signature bundle for your business and professional needs. This template contains 125 different layout options, HTML and PSD compatibility, free fonts and icons, and six to ten color options for each PSD. A help and HTML file are also included. 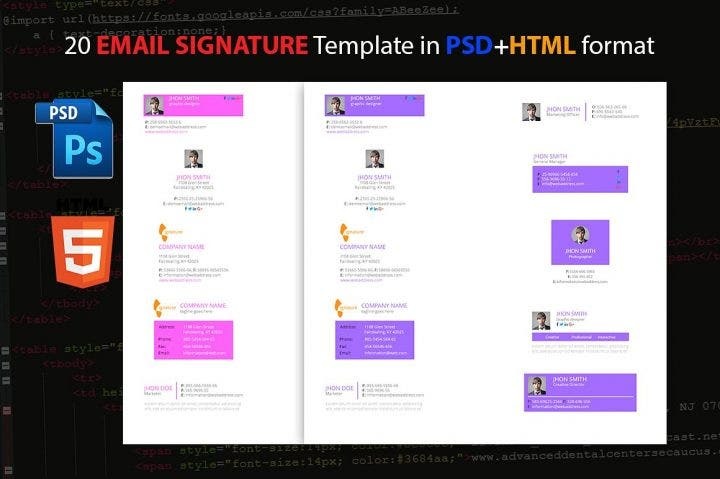 The last thing you want to do is spend a fortune on email signatures. If you are planning to purchase email signatures for yourself or for your own company, make sure you choose affordable yet quality templates. There are hundreds of sellers or designers in online graphic design shops like Best Templates, Creative Market, Graphic River, Zazzle, Etsy, and Stock Layouts, so make sure you browse from these shops first before you make your purchase. 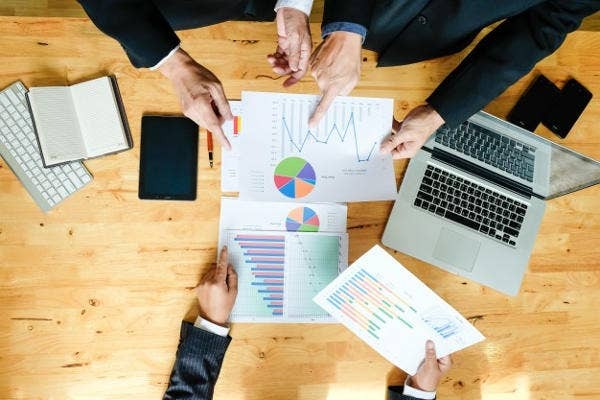 These online shops allow users to filter templates based on the design and price, making it easier to find the best template which fits your needs. The best thing about email signature templates is that they can be purchased in bundles. 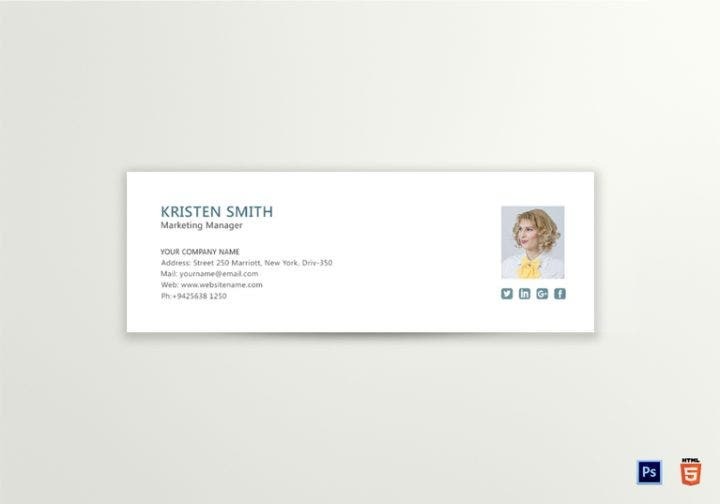 As seen in the templates above, a single purchase can include around 20 to even 1,000 email signature designs and colors (fully editable and customizable), more than enough for your use in the next year or two. And these email signatures don’t even cost that much, as prices even go below $3. So consider purchasing bundle packs as they give you convenience as well as savings. This is a tip that should be followed by all kinds of purchases. Always purchase from trusted sellers who have a reputation for selling quality products. This is also applicable to purchasing email signature templates in online graphics shops. Despite the mentioned shops above being known for selling quality designs and templates, don’t be complacent and make sure to double check and take note of some items before deciding to make any purchase. The first thing you must do is to check the designer’s profile for his previous works and collections. Make sure his designs are consistent and have a high level of professionalism. The second thing to do is to check for customer reviews. Templates are not supposed to be hard work for users who are purchasing them. Look for email signature templates that can be easily integrated into your graphic design software like Adobe Photoshop or Adobe Illustrator. If you have some experience in graphic design, the purchase should be the tricky part and not the actual editing template itself. Additionally, if you don’t know how to use your purchased templates, you can always ask for assistance from the designer or seller. Some designers even do all the editing and all you have to do is pay. So there you go—some sales email signature templates to get you and up and running for your marketing needs. Purchase them today!